Russian Federal Customs Service, in accordance with the letter of the Federal Treasury of 21.10.2011 № 42-7.4-04 / 3.5-1406 reports that since 1 January 2012 years accounting and distribution of customs and other payments from foreign trade between the budgets will be carried out on a separate account established Interregional operational FSA on balance sheet account number 40101 "Income distributed by agencies of the Federal Treasury to budgets of the budgetary system of the Russian Federation." The transfer of customs and other payments to the federal budget proceeds through the execution of a settlement document - a payment order. 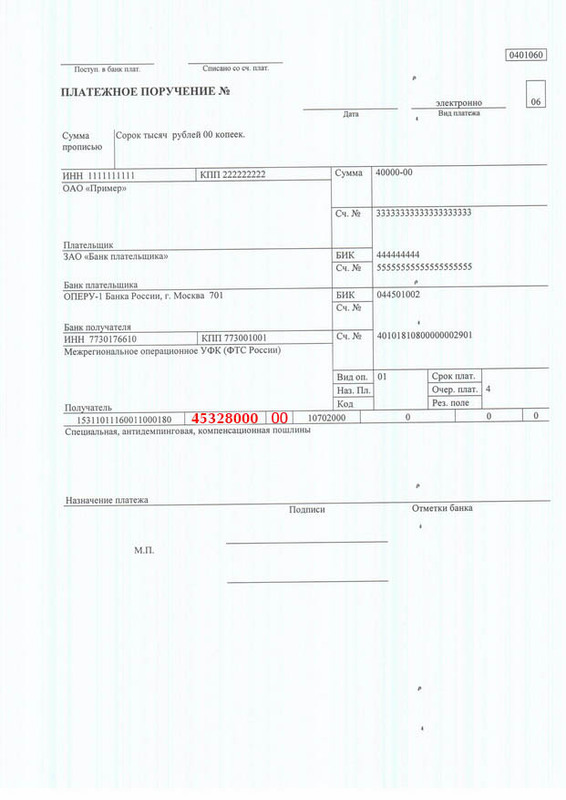 The format, procedure for filling in and filling out payment orders are set out in the position of the Central Bank of the Russian Federation from 3 October 2002 No. 2-P "On Non-Cash Settlements in the Russian Federation" and in the Order of the Ministry of Finance of the Russian Federation of 24 November 2004 No. 106n " Rules for specifying information in the fields of settlement documents for the transfer of taxes, fees and other payments to the budgetary system of the Russian Federation. " 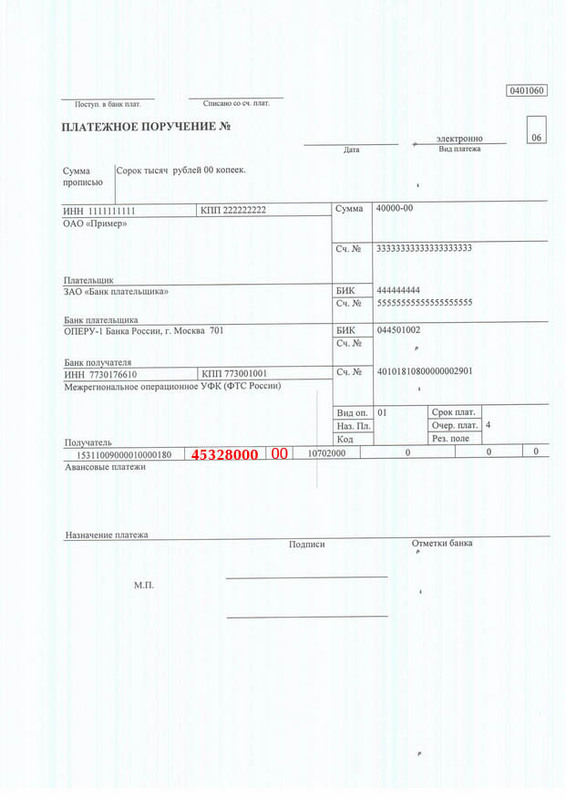 Making a payment document is permitted only one customs and other payment (budget classification code), administered by the customs authorities, according to the Russian Federation budget classification. (106) - in the field indicates the index of the base payment, which has 2 sign, in this case, it should be 00. (107) - eight-digit code of the customs authority in accordance with the classification of the customs authorities in the Russian Federation, to administer the payment. LETTER FCS of Russia № 01 -11 / 58349 from 30.11.2011. About the details of transfer of customs and other payments. Details of the new bill should be brought to the attention of payers of customs and other payments. Information about the funds are credited to the new account goes on FCS of Russia on the second working day of the year 2012. We offer to notify participants of foreign economic activity, planning to carry out customs clearance of goods in the first half of January 2012 years, the need to make an advance payment on account, currently in force. Attention data details are intended for Vladivostok customs. Attention, information is outdated, current information is available by clicking on this inscription. In the case of incomplete or inaccurate payment details and relates to outstanding to the destination customs are not communicated. To enroll you must apply to the payment of FCS of Russia with a request to clarify the details and a copy of the payment order by fax: (499) 499 73 00, (499) 913 93 90 or postal address: Russian Federal Customs Service, 121087, Ul. Novozavodskaya, d. 11 / 5, or to e-mail fts@ca.customs.ru. Letters must be necessarily from the participant of foreign economic activity to the Head of GUFTD and TR of the Federal Customs Service of Russia O.N. Komarova, an example of the letter below. 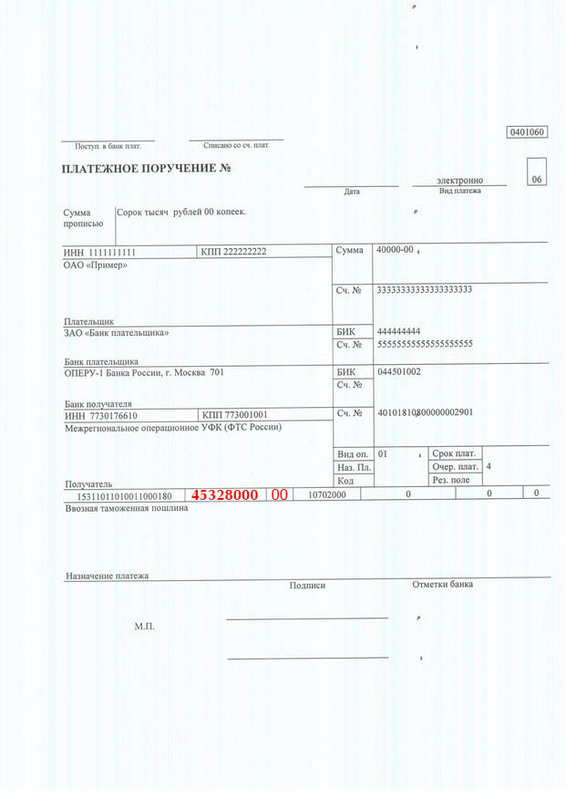 Hereby, Limited Liability *******, INN / KPP **** / ****, due to incorrectly completed payment order number from ** ******* year, in the amount of * ****** rubles, 104 field erroneously indicated *************************, asks in the number of payment order *** ** ******* on year, considered the best ************************, the amount of ********** rubles to offset as (- example - "Advance payment for Vladivostok customs (10702000) in payment of VAT and customs clearance fees"). After sending a fax request is recommended to contact the Head Office of Federal Customs Revenues FCS of Russia to confirm its timely processing by phone. (499) 499 73 05, (495) 449 71 30, (495) 449 70 31. If you sent via e-mail that you need to call (499) 449 72 35.